First you need to thread your loom with warp thread. Make sure it is of appropriate thickness to support your project ie. If you are making a heavy rug then you will want something akin to string or very thick cotton yarn, if you are doing something finer, then a less heavy thread would be ok.
Cut your warp threads to 2½ or 3 times the length you require for your finished work. Then thread one end through the hole in each peg. A threader or bent paper clip makes this job easier. Pull the yarn through until both ends are the same length, these form the skeleton of your work that you weave onto. The width of your project depends on how many pegs you use; obviously you can make smaller objects on a larger loom but not the reverse. Peg width and space between will determine how fine your finished article is, many looms have dual spacings. Once all the pegs are threaded slot them into their holes on the base and either knot the ends of three pegs together ie. six threads together, along the length of the loom. Or thread the ends from each peg through a “tail board” with the same number of holes as pegs and knot on the underside; this keeps the warp threads tidy and if hung over the edge of your working surface, keeps them under tension. You are now ready to start weaving. To create a neat edge at the end you may want to weave several rows of a finer material – maybe some yarn if you are making the body of your rug in raw fibre, which is repeated at the other end when you finish your weaving. Start weaving it in and out along the length of the pegs. When you have done this backwards and forwards for several rows you can begin with the fleece. Twist it into and begin replacing the spun yarn. What you do with the fleece is pull out lengths of wool and twist it, as if you were spinning it. As you twist and the length of yarn you have grows, continue to weave the twisted wool between the pegs. Remember to go round the outside of the end pegs to keep the width and ensure you are alternating the weave, that is, if it goes outside the peg in one direction, it should go inside it on the way back in the other direction. The thickness of the rug is determined by the amount of wool you pull out for the twist. If you twist less, you can leave tufts of wool that get felted in the rug over time or you can put a tight twist in. As you get to the end of the piece of wool you are twisting join another length into it by overlapping the ends of the length and continuing to twist the new one in. Always twist in the same direction. When you have nearly reached the top of the pegs lift each peg from the hole and slide your work down the warp replacing each peg as you go along the loom. Your work will build up down the strings as they hang down and cover all the warp threads. To finish, cut the warp threads free from pegs and knot in the same way as the start of project. You can then either leave them as tassels or using a large eyed needle, thread them back through the work in the direction of the other warp threads. Any other loose threads you may find can also be sewn in to the weft threads (the ones that go from side to side) in the same way. 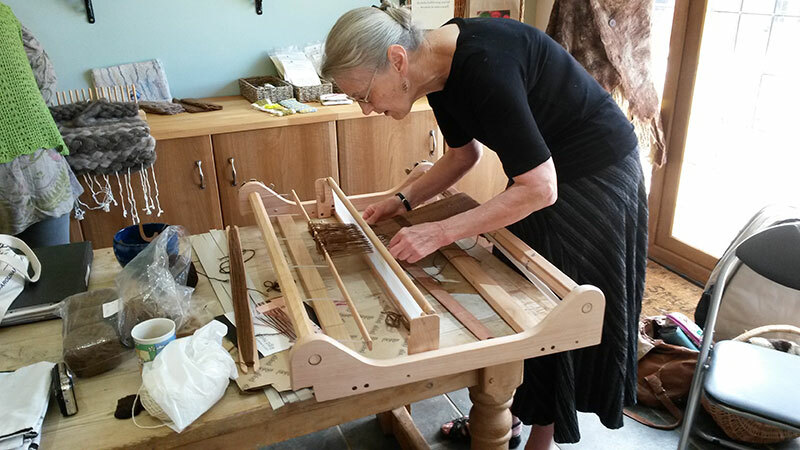 Just about anything can be used to weave on your loom: Fleece can be combed and rolled to make lengths for weaving. Leftover wool can be used and colours mixed to suit, if using a thin wool then try winding two balls together for a thicker yarn, or even crochet together two or three yarns to make a thicker multicoloured yarn. 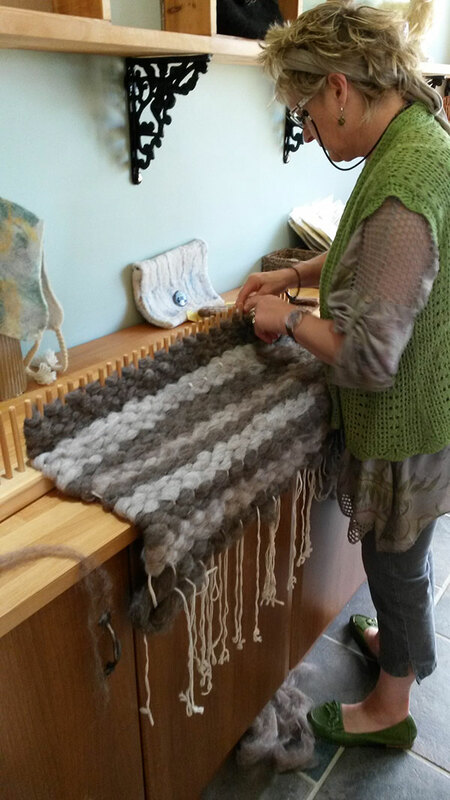 If you have a loom with closer smaller gauge pegs then thin wool can make a lovely winter scarf. Lengths of material can be cut into long strips 1½ inches wide, gently twist the material as you weave for more strength in the finished article. Old towels can be cut and woven to make bath mats. You can even cut and use old plastic bags in the same way. As well as the obvious use of the loom to make mats, pieces of work can be sewn together to make cosy winter throws, smaller pieces made from fleece are especially comfortable as seat covers and are very warm. Fleece mats will not take heavy continuous wear but are lovely for bedside mats. 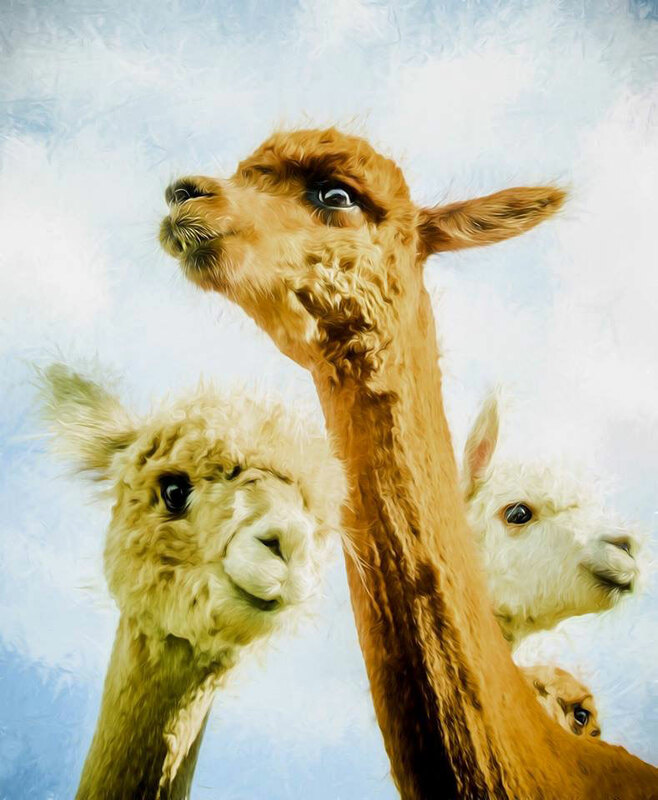 To wash natural fleece mats simply place in hot water containing some washing up liquid and leave to soak, then rinse in clear water and leave to dry as flat as possible. Do not agitate the mat in the water as this is what causes fleece to turn to felt. Alternatively for a harder wearing piece, you can hot wash to deliberately felt the article Once you have mastered the technique the uses are only as limited as your imagination.